Get up-to-the-minute developments at CNN's live blog on the disaster in Japan. 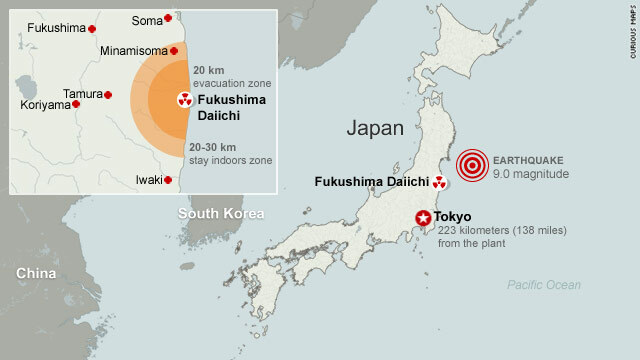 Tokyo (CNN) -- Efforts accelerated Saturday to restore power to nuclear reactors' cooling systems at the stricken Fukushima Daiichi plant, with government and power company officials trying to regain the initiative even as they cited a need to increase the limit of permissible radiation exposure for those working to avert further crisis. Workers have laid extensive electrical cable near the Fukushima Daiichi power plant's No. 2 nuclear reactor, the facility's owner, Tokyo Electric Power Company, said Saturday. As of noon, a Tokyo Electric official said the cables had yet to be connected to the reactor. This is part of an effort to restore power to the stricken reactors, which have largely been without electricity needed for their cooling systems since last week's 9.0-magnitude earthquake and subsequent tsunami. Company officials earlier said that an annex building near the No. 2 reactor will be a hub for the new electrical system, and that 1.5 kilometers of new cable would be laid. The Tokyo Electric officials said workers hope to fully restore power by day's end Saturday to plant's Nos. 1, 2, 5 and 6 reactors -- at the latter two units, replacing a back-up diesel generator that is now "providing power for cooling," according to the International Atomic Energy Agency. The plan is to get power up and running Sunday for the Nos. 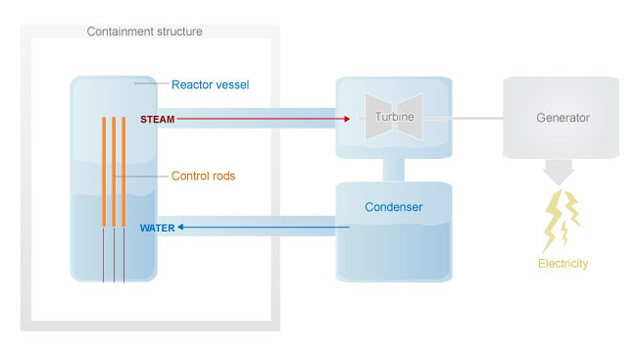 3 and 4 reactors. The electricity will power the reactors' cooling systems, aiming to keep temperatures low to curb the emission of radioactive material and, in a worst case scenario, a full nuclear meltdown. A meltdown occurs when nuclear fuel rods get so hot that they melt the steel and concrete structure containing them, spilling out in a worse-case scenario into the air and water with potentially deadly results. That said, outside of the nuclear facility on the island of Honshu in northeast Japan, there have been few indications of any immediate, dangerous fall-out from the crisis so far. One helpful fact is that, for the past eight days, the wind has likely blown most emitted radiation out to sea. Radiation levels around Japan have showed no signs of spiking considerably, according to measurements dated to just before midnight Friday posted online by the nation's education and science ministry. Even the two top readings in Mito (in Ibaraki prefecture) and Utsonomiya (in Toshigi prefercture) are well below what's considered dangerous to humans and fell in recent days. And whereas several explosions, caused by the buildup of hydrogen, rocked the Fukushima Daiichi plant in the days right after the quake, there have no such high-profile incidents in recent days. Graham Andrew, a special assistant to the IAEA director, noted efforts to use seawater to cool overheated spent nuclear fuel pools -- both by pumping in seawater, as well as in the case of Unit 3 by dropping tons of water from helicopters above and spraying even more from fire trucks -- in and around the Nos. 1, 2 and 3 reactors appear to be working. While each of those reactors have damage to their fuel cores, Andrew said they appear to be relatively stable for now. Still, no one has said that authorities are totally clear. In fact, authorities acknowledged Friday that the situation is far more serious than they'd originally estimated. In a written statement, Tokyo Electric's president Masataka Shimizu said "we sincerely apologize ... for causing such a great concern and nuisance." The company's managing director, Akio Komiri, broke down in a tears after leaving a news conference in Fukushima at which exposure levels were discussed. This came shortly after Japan's nuclear and industrial safety agency raised its rating for the crisis' severity (specifically, at the Nos. 2 and 3 reactors) from a Level 4 to a 5 -- putting it on par with the 1979 incident at Pennsylvania's Three Mile Island plant, the worst nuclear accident in U.S. history. According to the International Nuclear Events Scale, a level 5 indicates the likelihood of a release of radioactive material, several deaths from radiation and severe damage to a reactor core. Each step on the scale indicates an increase of 10 times the severity of the step below it, the International Atomic Energy Agency says. The Chernobyl nuclear accident in the former Soviet Union rated a 7, the highest level on the scale, while Japan's other nuclear crisis -- a 1999 accident at Tokaimura in which workers died after being exposed to radiation -- rated a 4. But Hidehiko Nishiyama, deputy head of the nuclear safety agency said that the rating change was not due to new problems at the plant. Rather, it came about after Japanese authorities got a better assessment of what had already happened, partly based on images showing damage to fuel rods and other structures inside certain reactor buildings. IAEA Director General Yukiya Amano cautioned against reading too much into the raised assessment, saying it is too early to make a full assessment. Yet Peter Bradford, a member of the U.S. Nuclear Regulatory Commission when the Three Mile Island incident occurred, said the Fukushima Daiichi crisis is worse than the partial meltdown of a single reactor at the Pennsylvania plant. "In terms of severity, this accident left Three Mile Island in the rear-view mirror several days ago," he said. And Tokyo Electric, itself, raised the radiation threshold for workers trying to avert a further crisis, according a report from Japanese public broadcaster NHK. The company said those at the plant can now be exposed to 150 millisieverts of radiation before they must leave the area, up from its previous standard of 100 millisieverts. For reference, an individual in a developed country is naturally exposed to about 3 millisieverts of radiation a year. Yet while the International Commission on Radiological Protection recommends no more than 50 millisieverts exposure in a given year for nuclear rescue and recovery workers, it offers no restriction in a crisis when "the benefit to others clearly outweighs the rescuer's risk." Tokyo Electric said it is doing all it can to protect workers' health and that it will not return to the plant any worker already exposed to more than 100 millisieverts. Japan's nuclear agency said Friday several hundred workers, including non-power company employees, remained on site. CNN's Stan Grant and Steven Jiang contributed to this report.